HOLIDAY HOMES, HOUSES & COTTAGES TO RENT IN SUFFOLK, ENGLAND. 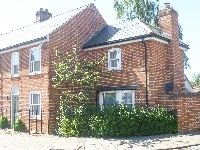 Welcome to our selection of holiday homes to rent in Suffolk, England. Suffolk is a beautiful county that is the inspirational settings for the famous English painters Constable and Gainsborough. The Suffolk Coast and Heaths, an Area of Outstanding Natural Beauty not only provide some of the best long distance footpaths passing through nature reserves rich with natural habitat for wildfowl and distinctive flora but also for its archeological finds. Many of these excavations have been weapons dating back from the Stone, Bronze and Iron Ages. There are many notable buildings with this historic county. One of the best is the intact fortifications of Framlingham Castle whose origins emanated from the 12th century. It was a castle of outstanding importance to Mary Tudor who was the only child of Henry VIII to survive childhood and who later took the throne after her brother�s death to tuberculosis. The castle is open to the public and offers longer visiting times during the longer daylight days during the peak season. The Coast is famous for its contrasting shore line with shingle, pebbles, golden sand and cliffs edging to wetlands giving way to footpaths that decorate the imagination as surely as it did of the region�s famous painters. Felixstowe offers an old fishing village and the opportunity to travel on the ferry whilst the resort of Lowestoft has been given the estimable Blue Flag award � Europe�s best beach awards for clean and friendly beaches. Not only is the area known for its artists but also the dramatic sounds of the composer Benjamin Britten. The formula 1 magnate Bernie Ecclestone was born here and though Ipswich is the only professional club in Suffolk, it has sired famous names such as Terry Butcher, Kieron Dyer and Matthew Upson. Horse racing at Newmarket is also home to Lester Piggott and Frankie Dettori. Also cricket is another favourite and enjoyed pastime. Looking for self catering holiday accommodation in Suffolk, then below is a selection of houses, holiday homes, flats and holiday cottages in Suffolk that can be rented direct from their owners. You can either click on each listing for further details or you can use our search engine on the left if you are looking for something in particular.